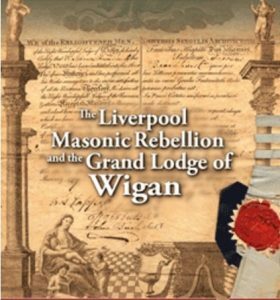 My third published academic paper was the result of my research on the Liverpool Masonic Rebellion and the Wigan Grand Lodge, which was published by The Historical Society of Lancashire and Cheshire, Vol.160, Liverpool, (2011), pp.67-88. It also became the subject matter of my third book which was published in September 2012. The themes of the paper included elements of social history and the development of Freemasonry in the north-west of England, themes that had been discussed in my two previous academic papers. I was introduced to the Historical Society of Lancashire and Cheshire as being a potential home for the paper while working as a history lecturer at Hope University in Liverpool, and the paper did indeed find a good home in the renowned journal. The paper had been presented to the Historic Society of Lancashire and Cheshire on the 24th March, 2010 and had also been presented previously at the Urban History Seminar at the University of Liverpool in March 2004. The topic of the Liverpool Masonic Rebellion has proved very popular as a talk on the lodge circuit. The paper can be freely downloaded from the link above which goes directly to the academia.edu website.